If you’re sitting on a fence about installing some solar motion lights, maybe going over the big reasons for which you should get them will help you get down with it. Why get solar motion lights? Solar motion lights are able to light up some dark areas and not only for security reasons. After all, you want to be able to climb down the stairs outside safely every time, but also like to be noticed if any intruders are in your backyard. You may also use this model of lights to create a more dramatic feel in your garden or to put some nice décor items under a better light. Light up the paths or some alleys with solar motion lights, as they may be bright enough to be a dependable option at night. What to look for on solar motion lights? You would need your solar motion lights to be weatherproof and heat resistant. Typically, you install them outdoors, so they have to take a rain, snow and not do over heat as well. Give a thought on the area you’re planning to illuminate, as you want your lights to be/not to be bright. Many models out there don’t come off directly to your eyes so you don’t need to worry about them blinding you. Check the solar panel also: the bigger it is, the more efficient is for charging. It wouldn’t hurt to pay attention to the installation of the motion lights. After all, you want to install them fast and easy. There are many models out there and either it’s the looks that counts the most to you or the power they give, you can always find the perfect model for your residence. 1). 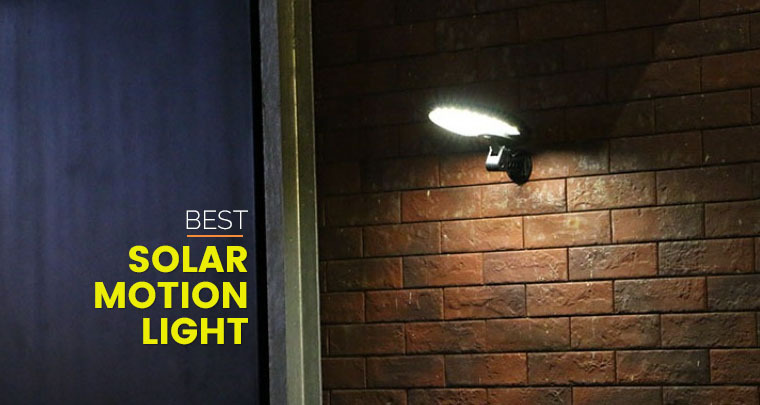 When you want to illuminate some dark areas around your house but don’t want to spend too much, a very good and dependable option is the Swiftly Done Bright Solar Power Outdoor LED Light. The light is very easy to install and you only have to peel and stick on the chosen place. It may surprise you, but the stick is actually very strong and the lights don’t fall. There are many things to appreciate on the lights and we need to mention that it’s not only solar energy powered, but also durable. It’s actually weather resistant and presents a heatproof plastic build. The light takes a splash and doesn’t overheat either. The automated switch means the light turns on at night and off once the morning has come. When it doesn’t detect any motion, the light is dim and the bright light activates only when sensing movement. The light is a great choice for illuminating stairways, pathways, decks or other areas. It detects motion within 10ft. and has a 120-degree angle. It’s made with RJ Technologies so the solar light uses 0.44W solar panel to charge throughout the day. The solar panel is durable and holds a 5-year use. Small, yet powerful, the light really sticks where you are installing it. You may also use some glue, when in doubt. It shines all night long and is quite dependable. Nevertheless, for the money you pay, you get a dependable, low priced and bright light that does its job. 2). 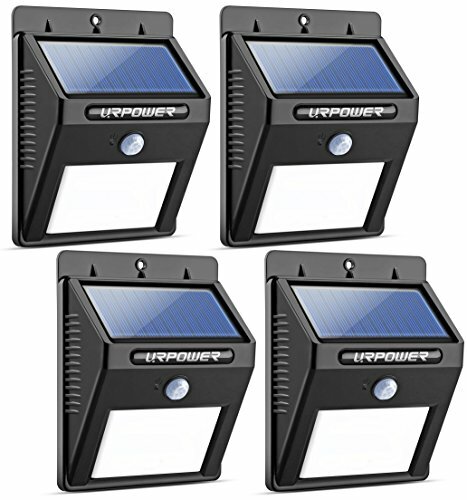 Build to take a rain and some weather challenges, the URPOWER Solar Lights 8 LED Wireless Waterproof Motion Sensor Outdoor Light for Deck are a great bang for your buck, more than anything else is. The lights are very easy to install and you don’t need any wires whatsoever. They are solar powered and made for the outdoors. We also like the lights as they feature an automated switch. They turn on automatically when the motion sensor identifies movement and turn off on sunrise. The build-in sensor is efficient and dependable with a ranging distance of 10 ft. and a 120-degree sensing angle. The construction of the lights is another thing to mention as they have an IP64 waterproof grade, handling a rain or a light snow. Additionally, they are heat resistant so the risk for overheating is minimal. The solar panel charges well and ensures a 12 hours run for the lights every night. It’s durable and works for around 5 years or so. It needs around 8 hours to fully charge. Reliable, bright and easy to install, the lights aren’t sophisticated, but do deliver light. Despite the minor issues, we still think the lights are a reliable option that doesn’t disappoint. 3). 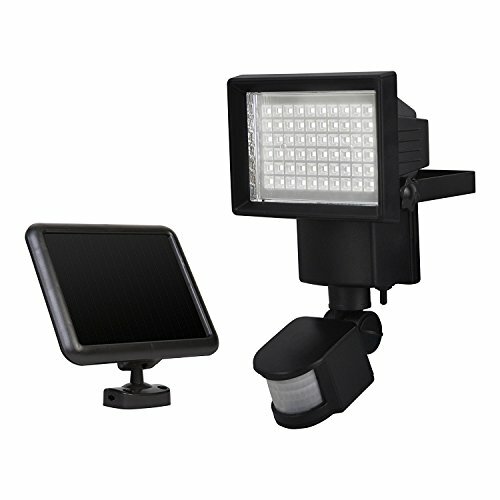 Well-made and able to help you for illuminating your pathway, Sunforce 82156 60-LED Solar Motion Light comes with many good things attached to it. The light feature an amorphous solar panel that is efficient, charging well throughout the day. The Li-Io rechargeable battery is strong and takes a good beat. The solar panel doesn’t need direct sunlight all the time and charges even if there are some clouds up in the sky. The light comes with 60LEDs that have a maximum output of 850 lumens. You also get everything you need for mounting and the light is easy to install. The detection distance is good (300ft.) and we also find the detection angle rather good (180 degrees). You definitely can install the lights for securing your garden, for instance. The light turns on automatically when it sensing a motion, whereas the TIME feature identifies the duration of the light (30, 60 or 120 seconds). We also have to mention the adjustability of the light. The LUX (light level) notices how dark it is and the SENS (sensitivity) identifies the range of motion. The IR sensor is responsive and you may easily adjust it for best performance. The light present a good build, with good quality materials and is weatherproof as well. For what it’s worth, we still consider the light dependable and bright, especially considering its price. 4). When you’re determined to only shop once for some good solar motion lights, you can definitely put your money at stake with the Litom 24 LED Solar Lights Outdoor, Super Bright Motion Sensor Lights Wide Angle. The lights includes 3LEDs on both side, which explains their efficiency for lighting up your pathways/deck/garden. They present a wide-angle design, which ensure a large coverage of the designated area. The light is bright and the maximum output is 526 lumens, whereas the lighting angle may reach 270 degrees. You need no wiring for installing the lights and the only thing to consider when installing them is to put them in a direct sunlight all day. The more sunlight they get the better and faster they charge. The adjustability of the lights is another thing to mention and you can use three modes, according to your specific needs. You may use the full-on mode for the outdoor patio/front door/back door and the reduced light mode for a garage or driveways. The motion-detected mode seems to be the best choice for a fence, path or a garage. The motion sensor is sensitive and able to identify movement to 26 ft. away. The best height for installing the lights would be 5.6-6.6 ft. The lights have a rugged build and take the long time use. They are made with high-impact ABS material and present an IP65 waterproof grade. This means they can take a drop and some splashes. The strong build, the bright light and the wide lighting angle make the lights a good investment any time. For the strong build, wide-angle lighting and so many other good features, we don’t change our mind about recommending the lights. 5). 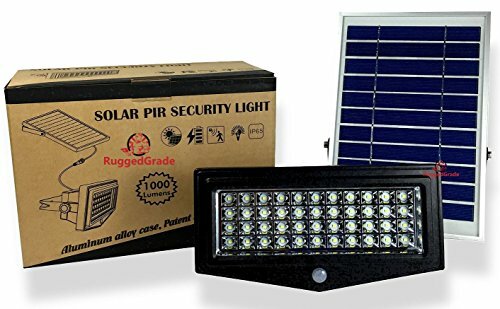 The high quality craftsmanship of the High Power 1000Lumen Solar Motion LED Flood Light –10 watts of High Power Light is one of the good things that make this light such a reliable solar motion light. The light gives a maximum output of more than 1,000 Lumen so you may easily light up your backyard, for instance. The LED is 10Watts, which lets you use the light for security reasons also. The motion and light sensor built-in means the light gets almost instantly from 10% power to full brightness when movement is identified. The range distance is about 0-5 meters down to 10 lux. The light remains bright for 30 seconds. We also like the versatility of the light as it provides three modes: bright, dim and recharge. Not only the light gets from dim to bright when it detects motion, but it also turns off in daylight, going into recharge mode. The light is easy to install and to adjust and so is the solar panel. You don’t need an electrician and you may easily mount them onto wall or other surface. 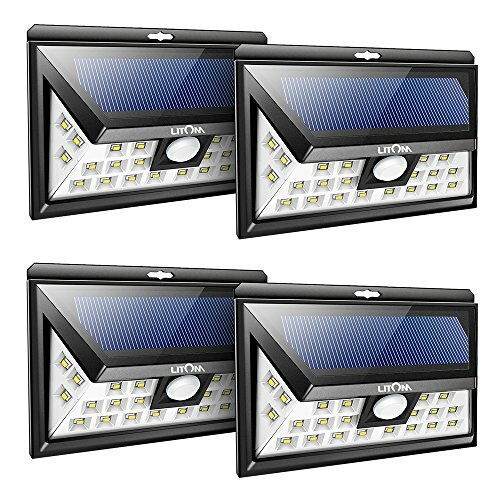 You may mount separately the solar panel and the LED in order to get the best results. You also get a 3.5-meter cable. The 8000Mah battery is impressive and holds its charge. It takes the intense use, for a very long time. You may change the battery without replacing the unit. The housing material is aluminum alloy and toughened glass, which give longer lifespan on the light. The IP65 rating makes the light safe to use on a rainy day. The light is bright and the motion detector is sensitive. The rugged build and the adjustability of the light recommend it as a good buy anytime. All in all, the light is bright, sturdy and easy to mount which counts so much on any solar motion light.